It's going to be a long one. The weekend, we mean. And as much as you'll try to behave (you're always the voice of reason), your fellow beach volleyballers or your gin-happy bartender may have other ideas. So we're thinking that come Sunday morning, you'll need a remedy. Something sweet to open your eyes, but also a touch of that fatty, salty... bacon-ness that every morning-after loves. 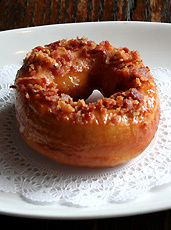 Yes, we're talking about Toffee-Bacon Donuts, a welcome new fixture on the brunch menu at Birch & Barley. You won't need to roll in until midafternoon, as it's an all-day brunch, but when you arrive, your donut—made from an eggs-and-butter-laden brioche dough—will have already spent several hours rising... as if it knew you were coming. Then, once a tall pint of hair-of-the-dog is safely in your hand, you'll send up the signal. It's time for breakfast to hit the fryer—and then your plate. But not before it gets glazed with a rum-and-brown-sugar toffee and crusted with pulverized applewood-smoked bacon, applied immediately so your soft and chewy breakfast is still warm when it hits your lips, the sweetness tempered by the salt and the smoke. If you're craving more traditional donut options, it's okay: the bittersweet chocolate and salt or the lemon-poppy glazed await. If you make a reservation for next Friday night (which just happens to be National Donut Day), you can opt for a dessert sampler of all three, paired with three rare beers. 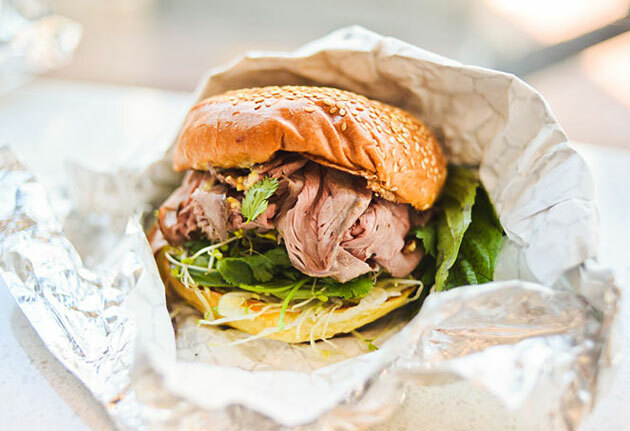 The Homer Simpson of restaurant pairings.